At the museum today we visited a traveling exhibit of Early American quilts from The Winterthur Museum in Delaware. Winterthur is famed for its period room settings featuring furniture, fabrics, quilts, and decorative arts collected by Henry Francis du Pont (1880–1969). 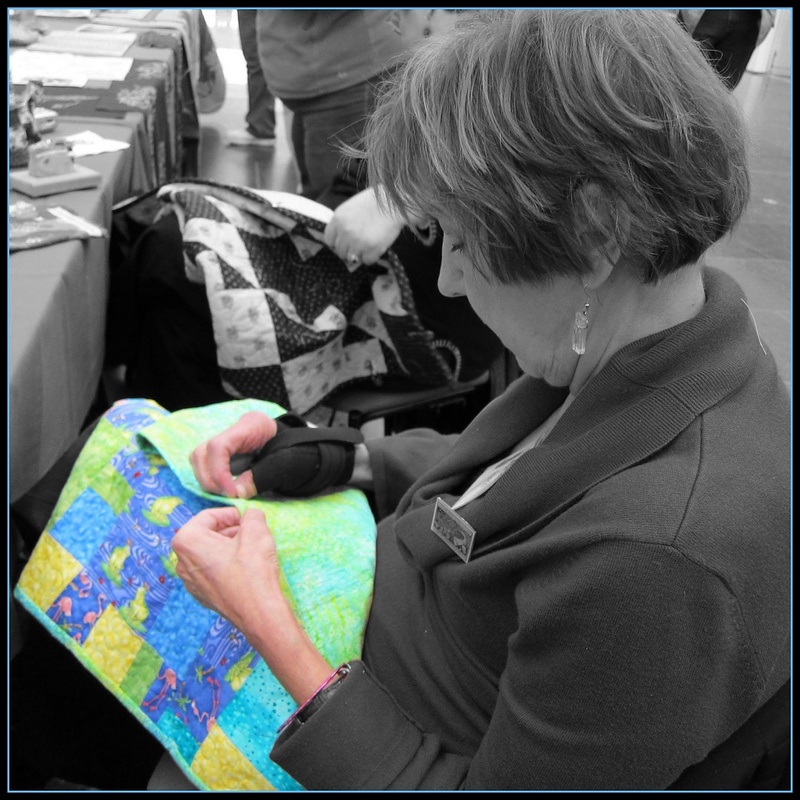 A group of local quilters were seated outside the exhibit, giving a demonstration of their craft by means of an old-fashioned quilting bee. They were a lively and sociable group and when I learned the name of their chapter is "Hospitality Quilters", I was not surprised. The quilt being shown here is for a newborn and will be donated to a local hospital. Love the colors, and it looks like very intricate quilting. Allison! You were right near me! About 10 minutes away. We live right near Winterthur! Over the border in PA. I had a hard time realizing it sounded like "Wintertur." We're closer to Longwood Gardens...also a treat. I love this photo and your treatment! Like the selective color in this shot...effective editing. Love the focal black and white! Quilting is such a nice skill. I just love the creations that come from it. Nice effects. I admire people who do those beautiful quilts. I would not have the patience it takes. I like the use of b/w mixed with the colors. nice shot. I've seen those handstitched quilts and they just amaze me with the size and number of stitches. I have a hard time finishing a machine stitched quilt so the handstitching is quite daunting.